Created by Bill Williams. The Alligator is a combination of balance lines (moving averages) that use fractal geometry and non-linear dynamics. It consists of 3 lines: Jaw, Teeth and Lips. Typically, a smoothed moving average (SMMA) is used with periods/ shifts of (13/8, 8/5, 5/3) respectively for the lines. The Alligator is a trend following indicator that produces trades during trend moves (which Williams found to occur about 30% of the time) and sits out during sideways markets (occurring 70% of the time). Williams steered away from sideways markets, believing that individuals and institutions could make their money when the strong trends emerged. That also meant sitting with one’s hands tied until the Alligator opened its mouth to eat up trend trading profits. I loved Williams imagery, creativity and simplicity in describing market opportunities and the Alligator is one such character that he developed to help traders simplify and visualize their opportunities. The Alligator provides trading signals when the Lips cross down below the Teeth and the Jaw, signaling a sell. When the Lips cross upwards through the Teeth and Jaw, that signals a buy opportunity. Because the Lips use a sensitive 5-period SMMA, it turns the fastest and the Jaw, which uses a 13-period SMMA, turns the slowest among the 3 averages. Williams refers to an uptrend or downtrend signal as the Alligator awakening. The first thing an Alligator does upon awakening is to open its mouth and yawn. As the Alligator smells the food of a Bull or a Bear, the Lips, Mouth and Jaw separate, and the market is either bullish with long positions in order, or bearish with short positions in order, as the Alligator is eating with his mouth wide open. When the market runs out of steam and the Alligator is sated, the SMMA’s converge, indicating the Alligator has had enough profits to eat, so profit taking and repositioning is in order from a trader’s perspective. When the market is sideways and the Lips, Mouth and Jaw are crisscrossing due to choppy markets, the Alligator is sleeping and traders should sit on the sidelines waiting for the Alligator to wake up and start eating again. The longer the Alligator sleeps, the hungrier it becomes upon awakening. Traders beware of the false trading signals when the Lips cross above the Mouth and Jaw, only to find itself losing steam and crossing back the other way. 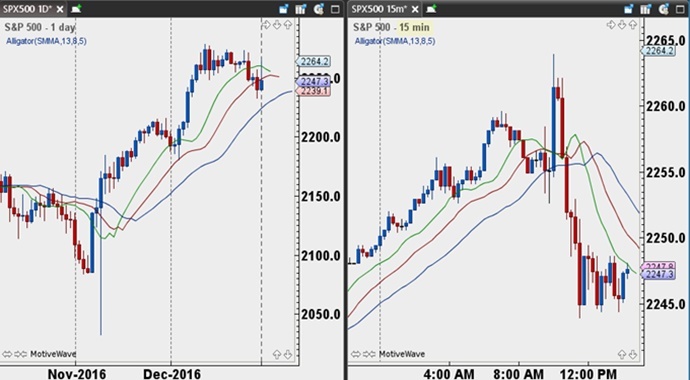 In the S&P example below, with the daily chart on the left and the 15-minute chart on the right, it illustrates that the Alligator can be used on different time frames. Each time frame can be traded separately, or they can be traded as a team, meaning, entries and exits can be taken on the 15-minute chart with the daily trend in mind. For example, with the daily uptrend entrenched, one can use the 15-minute Alligator to take long positions once the Alligator becomes hungry and opens its mouth wide to eat profits. The 15-minute Alligator can also be used to take profits once the Alligator becomes sated and starts to sleep. The Alligator is a wonderful trend-following system which teaches patience when the Alligator is sleeping and confidence once the Alligator wakes up and starts eating. This entry was posted in Trading Tips and tagged alligator, forex, forex trading, indicators.